Hey howdy hey! Three weeks ago I posted part one of how to help your family get ready for a successful photo session. If you missed it, be sure to check it out. This week we're finishing up with an encouraging word to the dads, re-emphasizing that photos sessions should be FUN, trusting your photographer to get genuine smiles from your kids, planning an activity during your session and finally, considering an early morning session! So let's dive in, y'all. #6 - Dads, we need you to have fun and participate during the photo session too! Most of the dads I get to photograph are cooperative and involved. They play and laugh with their kids. They read books. They run around and have fun. This is the norm, and I'm SO glad. I've heard some not-so-great stories from other photogs. Yikes. So when I say "Dads, we need you to have fun and participate too!," I want to encourage you to keep up the great work! Dads, y'all are so important to your kids. There are ways only you can interact with your children that's truly special. I want to show that off in your family session so you can look back and remember fondly the days when your children were young. This is Keith. He was totally hands on with his fun crew during their in-home lifestyle session. Drew is always a fun dad t work with! He's genuinely happy to have his picture taken with his sweet girl. Check out my foster and adoption gallery to see more of this sweet fam. Ahem: this is another way in which filling out your questionnaire gives us an advantage during our session. If dad is apprehensive (and many are- it's totally normal) then you have the opportunity in the questionnaire to tell me what dad enjoys doing with the kids. #7 - Photo shoots are for having fun!! We talked about having fun during photo sessions from #2 in Part One but it warrants reiterating. Taking pictures is a FUN activity when done well. If you've chosen a photographer whose personality and style matches our family's and have done your homework (session questionnaire, styled your family's outfits with your photographer, prepared for your session as directed by your photographer), then this will surely happen. A good photographer can put your family at ease while engaging you and your children naturally, which will then allow all of you to relax and enjoy the process. A behind the scenes look at a family in-home session. #8 - Cheese is for crackers. We want authenticity, not forced smiles, y'all. This is a big one. It's a habit of parents to get behind the camera and try to make their kids smile. And if we're having trouble because little brother is cranky and doesn't want to play, then parents are super, super helpful. After all, you know your kiddos best! My youngest with his cheesy, forced smile. Every kid has one, and man is his a doozy! This is my youngest son, Noah Wayne. He's the prettiest boy I've ever seen. Yes, I know I'm partial. However, when someone tells him to "Say cheese," or "Smile!" well, you can clearly see what happens. Exit pretty, enter borderline-scary-all-teeth-veins-bulging... wait is it a grimace? I don't even know what to call it but it's definitely not a smile. This genuine smile melts my heart! It's the smile every momma wants when having their pictures taken. In this picture, though, I engaged my pretty boy while he was in his natural element, just hanging out playing on the playscape in our backyard. It may take a few moments for a photographer to get to this point with your kiddos, especially if your kids are shy or introverted, but we'll get there! Give us a chance, and if we need reinforcements, we'll happily ask for your help... as long as you just don't ask them to "Say Cheese!" or "Smile!" If I'm taking pictures for an in-home session this comes naturally. Kids are in their own home, they're not as bashful and they're usually pretty excited to show off their home. Showing me all his "beep beeps," during our in-home lifestyle session. A planned activity is still helpful though. What does your family like to do?... read books, listen to music and dance, play games, play in the backyard, bake muffins, paint… the possibilities are endless. Little Sam jamming it out during our family lifestyle in-home session. If we're doing an outdoor session away from home, though, this is when this tip comes in extra handy! Whatever we choose, it'll be fun and will help the kids last a little longer! It's no secret kids typically do better in the morning, particularly if they're younger. If you're not attached to a sunset session, a sunrise session may be just right for you, especially if your kids are early risers. No-brainer there. Schedule that photo shoot for sunrise and get your day started smiling and laughing with your kids. Perfection!! 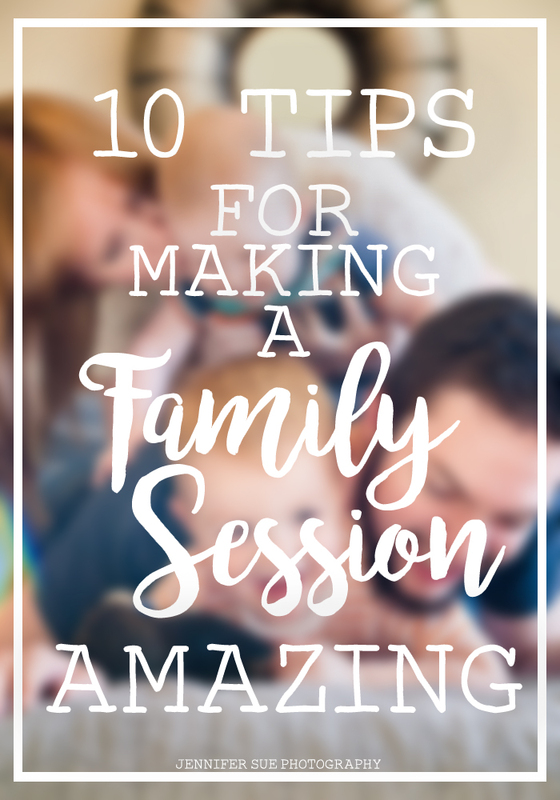 If you missed part one of how to prepare for a wonderful family session, head on over and take a look. Have questions about preparing for an in-home family photo session? Toss me an email. I'd totally enjoy chatting with you!